You needn’t be a professional to stain oak furniture, cabinets or anything in between. If done properly, staining and finishing the wood can be a rewarding do-it-yourself experience. Staining oak furniture enhances the look of the wood while adding a decorative finish. Properly prepping the oak is the key to making your stain look as good as possible. Use a 100-grit sanding sponge to sand flat surfaces, and 100-grit paper to sand tight corners. Sand with the grain of the oak and cover every thing. Any imperfections not sanded away will appear once the stain is applied, so you want the oak to be as smooth and flawless as possible. Once you’ve sanded away the major imperfections, wipe the oak piece clean with a dry cloth. There are a number of stains on the market. You want to choose a stain that looks good and is easy to apply. Both pigmented and penetrating oil-based stains are suitable for hardwoods such as oak. Pigment stains are easy to apply; however, they tend to obscure the grain of the wood. 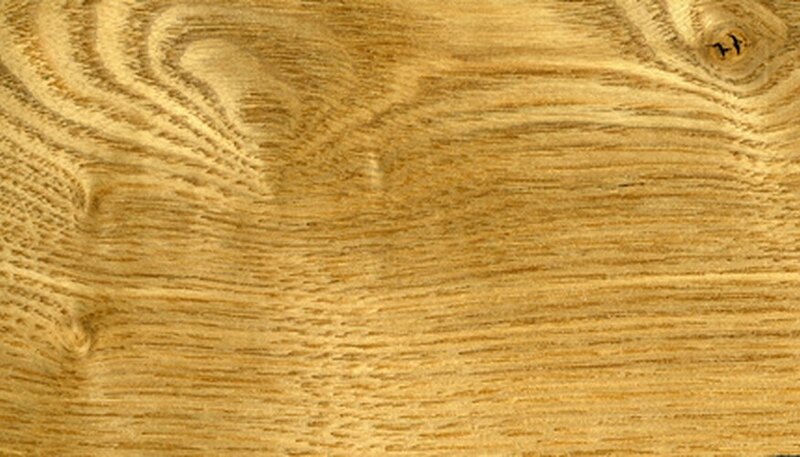 Penetrating stains, as the name suggests, penetrates the wood, allowing more of the grain to show. Choosing the right color stain is also a necessity. For dark oak, consider mixing one part burnt umber with four parts raw sienna. For lighter oak, four parts raw sienna mixed with one part raw umber works well.. The best way to apply the stain is with a new, soft-bristled paint brush. The exact size will depend on the job, as you may need a smaller brush for more intricate work. Usually, a 2-1/2 inch brush will suffice. When brushing the stain on to the oak, you want to follow the grain of the wood. You’ll also need plenty of dry, clean rags to wipe excess stain off of the wood. Brush on enough stain to saturate the oak, and then wipe away the excess. Again, when wiping away the stain, follow the grain. Do not let the stain dry before wiping it away, as it will get sticky. If the stain looks too light, add more. When you’re done, let the stain dry overnight. After all your hard work, you want your stain to last. Therefore, it’s best to apply sanding sealer and varnish. You can purchase these at any hardware store. After the stain has dried, brush on the sanding sealer with a new paintbrush, following the oak’s grain. Apply the sealer evenly and let it dry. After it has dried, use a fine-grit sandpaper, such as 280-grit, to sand the surface. Sand very lightly so as to not cut into the stain. When the oak appears slightly dull and is smooth to the touch, you’re done sealing. Wipe the oak clean with a dry cloth. Apply the varnish of your choice with a clean paintbrush and allow it to dry overnight. If you don’t like the look, you can always re-sand and reapply.